Drug-induced liver injury is an important clinical problem and a challenge for drug development. Whereas progress in understanding rare and unpredictable (idiosyncratic) drug hepatotoxicity is severely hampered by the lack of relevant animal models, enormous insight has been gained in the area of predictable hepatotoxins, in particular acetaminophen-induced liver injury, from a broad range of experimental models. Importantly, mechanisms of toxicity obtained with certain experimental systems, such as in vivo mouse models, primary mouse hepatocytes, and metabolically competent cell lines, are being confirmed in translational studies in patients and in primary human hepatocytes. Despite this progress, suboptimal models are still being used and experimental data can be confusing, leading to controversial conclusions. Therefore, this review attempts to discuss mechanisms of drug hepatotoxicity using the most studied drug acetaminophen as an example. We compare the various experimental models that are used to investigate mechanisms of acetaminophen hepatotoxicity, discuss controversial topics in the mechanisms, and assess how these experimental findings can be translated to the clinic. The success with acetaminophen in demonstrating the clinical relevance of experimental findings could serve as an example for the study of other drug toxicities. In contrast, predictive DILI occurs mainly after intentional or accidental overdose of a drug. The most clinically relevant drug in this category is acetaminophen (APAP, paracetamol). In the US, APAP overdose is responsible for 78,000 emergency room visits and about 500 deaths per year.5 In addition, APAP hepatotoxicity is the most frequent cause of acute liver failure of any etiology, accounting for approximately 50% of all cases.6 Unlike idiosyncratic DILI, APAP hepatotoxicity can be modeled in rodents, primary hepatocytes and in certain cell lines. An increasing number of translational studies demonstrate that these animal models are valuable tools to investigate the mechanisms of toxicity and to identify potential therapeutic targets.7 However, despite the unique situation of having relevant in vivo and in vitro experimental systems available, there are still many controversies that hamper progress in understanding the mechanisms of APAP hepatotoxicity and, consequently, the reliable identification of clinically relevant therapeutic targets. This review will address these controversial topics, including intracellular signaling mechanisms of toxicity, mode of cell death, and the role of sterile inflammation from animal models to the most recent clinical findings. Fig. 1 Experimental models to study acetaminophen (APAP) hepatotoxicity. The most common models used to study APAP hepatotoxicity are mice, rats, primary mouse and human hepatocytes (PMH and PHH, respectively), and hepatoma cell lines. However, the mechanisms of injury and mode of cell death differ. In mouse models and in humans, APAP-induced liver injury involves mitochondrial damage, oxidative stress, c-jun N-terminal kinase (JNK) activation, and nuclear DNA fragmentation. The mode of cell death in these models is oncotic necrosis. However, rats develop little or no oxidative stress and thus no injury, while hepatoma cells may develop injury but through different mechanisms than mouse or human hepatocytes. In the latter case, the mode of cell death is almost always apoptosis. The results suggest that mice and PHH are the best available models for the study of APAP toxicity. A consequence of the mitochondrial dysfunction is nuclear DNA damage (Fig. 1). Genomic DNA fragmentation as a hallmark of APAP toxicity in mice and mouse hepatocytes has been recognized for some time.41,42 DNA fragments can be internucleosomal fragments of approximately 180 base pairs and multiples thereof, as detected by DNA ladder.41 This implicates a role for endonucleases in this process rather than oxidant stress.17 The nuclear translocation of endonuclease G and apoptosis inducing factor (AIF) from the mitochondria correlates with the nuclear DNA fragmentation.43,44 Endonuclease G and AIF, which are mitochondrial intermembrane proteins, are released initially by mitochondrial outer membrane permeabilization through a Bcl2-associated X protein (bax) pore and later, after the MPT and mitochondrial matrix swelling, by rupture of the outer membrane.45 The DNA damage can activate DNA repair processes including poly(ADP-ribose) polymerase (PARP), which may accelerate cell death by excessive consumption of nicotinamide-adenine dinucleotide (NAD). Although APAP-induced DNA damage activates PARP and depletes NAD, the absence of the enzyme actually enhanced the injury, indicating that activation of DNA repair is beneficial.46 Thus, DNA damage caused by mitochondria-derived endonuclease and others contribute to cell necrosis, and attempts to repair the damage limit the injury and support recovery. 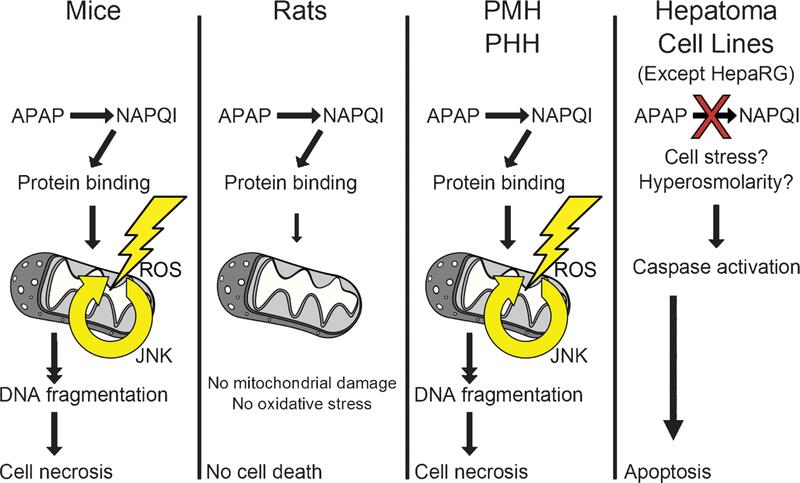 Damaged mitochondria are critical for the pathophysiology of APAP-induced cell death. Endogenous defense systems (autophagy) can remove damaged cell organelles and modified protein by enveloping them with membranes (autophagosomes) and fusing these structures with lysosomes.47 Autophagy is activated after APAP overdose.48 Inhibition of autophagy attenuates liver injury, suggesting that autophagy is an adaptive mechanism to stress and limits injury.48 In addition to classical autophagy mechanisms, newly recognized mitochondrial spheroids can also contribute to the removal of damaged mitochondria.49 However, these processes are only effective in the outer area of risk.47 Additional effects, such as drp1 translocation to mitochondria that promotes mitochondrial fission, appear to enhance cell death.37 The role of mitochondria biogenesis remains unclear because the protection against APAP-induced liver damage by peroxisome proliferator-activated receptor gamma coactivator (PGC)-1alpha,was caused by the activation of nuclear factor-like 2 (Nrf-2)-dependent antioxidant genes.50 Thus, adaptive mechanisms to drug-induced cellular stress are clearly affecting liver injury and could be potential drug targets. All of the discussed mechanisms of APAP-induced liver injury were investigated using a number of different in vivo and in vitro models. Selecting the most appropriate experimental model, which closely resembles the human pathophysiology, is critical for the clinical relevance of the mechanisms derived from these models. The most frequently used preclinical species for drug hepatotoxicity are rats and mice. Testing new drugs in rats is still required for standard safety evaluations by regulatory agencies. In the case of APAP-induced DILI, the rat is clearly a poor model.12 Rats can metabolize APAP to form a reactive metabolite and cause GSH depletion and protein adducts formation, even in mitochondria.58 However, they do not develop mitochondrial oxidant stress or JNK activation and consequently develop very little if any liver injury (Fig. 1).58 It remains unclear at this point if the lack of progression in rat liver is due to the delay in protein adducts formation, or if as of yet unidentified specific protein targets are not hit by NAPQI. Although there is the potential to learn more about the initiating events, the mechanisms of injury in rats and the severity of injury do not reflect the human pathophysiology. Nevertheless, large numbers of studies are still being published that test the hepatoprotective potential of natural products using the rat model (reviewed59). In addition to using an insensitive animal model for their drug hepatotoxicity studies, another caveat of most of these investigations is that the plant extracts are largely uncharacterized and the potential effect as a P450 inhibitor of one or more of the chemicals in the extract is rarely tested. In vitro models are indispensable tools to identify drug toxicity and assess molecular mechanisms. Many of the mechanistic details described in previous paragraphs were investigated in freshly isolated mouse hepatocytes. However, in addition to the obvious advantages of an isolated cell preparation, there are limitations that need to be considered.67 Among others, primary hepatocytes lack non-parenchymal cells, they are exposed to artificial media during isolation and culture, and they are generally cultured under hyperoxic conditions (room air oxygen levels).67 This may lead to numerous gene expression changes, enhanced oxidant stress, and many other potential modifications.67,68 Loss of cytochrome P450 enzyme activity over time in primary cells in culture is one of the most critical gene expression changes in studies of drug toxicity.69 This will affect the sensitivity to drugs such as APAP. Recent advances in sandwich culture techniques and 3D culture ameliorate some of these problems,67 but this improvement comes with a price. These additional manipulations are more cumbersome and time consuming and likely increase the cost of the experiments. Nevertheless, studies with primary cultured hepatocytes can provide new mechanistic understanding if the limitations are considered and the data are verified in vivo. Primary human hepatocytes (PHH) are the most relevant in vitro model for studying human pathophysiology. However, availability is limited and it can be prohibitively expensive. Cryopreservation of cells can make them more easily available, but in general, cryopreserved cells are of lower quality. While these cryopreserved cells may be suitable for drug metabolism studies, they are not useful for many other types of experiments. This is especially important for drug toxicity studies. Freshly isolated cultured human cells are clearly superior as they reflect closely the gene expression pattern of the liver in vivo. Recent studies with APAP hepatotoxicity documented the very close correlation between the time line of toxicity (onset and peak of cell death) in PHH and onset and peak of ALT elevation as an indicator of liver injury in overdose patients.63,65 However, the overall sequence of events leading to cell death after APAP in PHH is very similar to mouse hepatocytes, including GSH depletion, cytosolic and mitochondrial protein adducts formation, JNK activation and translocation to mitochondria, mitochondrial dysfunction, and collapse of the mitochondrial membrane potential preceding cell death (Fig. 1).63 Importantly, APAP induces necrotic cell death in PHH similar to mouse hepatocytes.63 Overall, like the translational work with overdose patient, these studies with PHH confirm that the mouse model of APAP hepatotoxicity is the most relevant animal model for studying these mechanisms. Despite using clinically relevant experimental models, some topics remain controversial. This is almost always an issue of experimental design and interpretation of experimental data. DNA fragmentation is observed during apoptotic and necrotic cell death. Predominantly small fragments are formed during apoptosis, and larger fragments are generated during APAP-induced necrosis.81 The characteristic smaller DNA fragments during apoptosis (multiples of 180–185 base-pairs) are formed by caspase-activated DNase (CAD).76 In contrast, DNA fragmentation during APAP-induced cell death is caused by mitochondria-derived endonuclease G and AIF, as discussed above.43,44 One of the most frequently used assays to visualize DNA strand breaks is the TUNEL assay. Because the assay detects DNA strand breaks, apoptotic and necrotic cells will stain positive. However, the staining patterns are different, with mainly nuclear staining in apoptotic cells and both nuclear and cytosolic staining in necrotic cells.75 The cytosolic staining is likely caused by the release of large DNA fragments due to karyorrhexis and karyolysis, which are still recognized by the terminal deoxynucleotidyltransferase. In patients, nuclear DNA fragments were detectable in plasma after APAP overdose.61 However, similar to the mouse model, extensive procaspase-3 protein levels were observed in blood of patients with APAP-induced liver injury but not in patients without liver injury.61 In support of these findings, no caspase-3 enzyme activity was measured in any APAP overdose patient.61 In addition, the caspase-cleaved cytokeratin-18 fragment was either not detectable or represented only a minor fraction (<15%) of the total full-length cytokeratin-18 released into the blood in these patients.82 Together these results in patients and, as discussed in the previous paragraph, in PHH support the hypothesis that, similar to mice and mouse hepatocytes, the primary mode of cell death in APAP hepatotoxicity in humans is necrosis. As the example of APAP-induced liver injury demonstrates, a clear distinction between apoptotic and necrotic cell death cannot be achieved by assessing a single parameter. Use of a combination of parameters, e.g., caspase activation, cell morphology, and DNA fragmentation, is mandatory for solid conclusions. In addition, the use of positive controls will give insight into how much parameters change with a certain percentage of apoptosis and allow more confident conclusions regarding the mode of cell death. Knowledge of the type of cell death is not only important because of the intracellular signaling pathways involved, but also because it determines the degree of inflammation that occurs in response to the tissue damage. In APAP overdose patients, DAMPs such as nuclear DNA fragments, mtDNA, and HMGB1 are extensively released into the plasma with a time course similar to ALT and aspartate aminotransferase (AST).61,82 Interestingly, serum levels of these DAMPs are better predictors of poor outcome (liver failure and death) than ALT or AST.82,91 Certain cytokines, including IL-6, IL-8, and monocyte chemoattractant protein 1, are substantially elevated during APAP toxicity.92 However, neutrophils are not activated in patients during the peak of liver injury.93 Neutrophil activation correlates with declining ALT levels, i.e. with the recovery phase during APAP overdose in patients.93 These findings suggest that no direct neutrophil cytotoxicity is involved in the human pathophysiology. Similarly, hepatic macrophages derived from resident Kupffer cells and recruited monocytes contribute to the tissue repair process during APAP-induced acute liver failure rather than aggravate the injury.94 In addition to removing necrotic tissue, the lost liver cells need to be replaced by proliferation of surviving cells. More recent data have provided insights about additional players in liver regeneration after APAP. The Wnt/β-catenin pathway is emerging as a central player in the regulation of liver development, growth, and regeneration;105 and its importance in APAP-induced hepatotoxicity has been explored. Biphasic increases of β-catenin expression are observed in mice, and β-catenin knockout mice have reduced liver regeneration.106 Interestingly, the evaluation of human liver biopsy samples has indicated that β-catenin activation is strongly associated with patients who undergo spontaneous regeneration without liver transplantation.106 Similarly, increased serum alpha-fetoprotein, a sign of hepatic regeneration,107 correlates with a favorable outcome in APAP overdose patients.108,109 From studies like these, a better understanding of liver regeneration may lead to improved prognostic indicators that can supplement existing criteria to determine candidates for liver transplantation among APAP overdose patients. APAP-induced liver injury is the most frequently encountered drug hepatotoxicity and cause of acute liver failure in the United States. In addition, APAP is the most used experimental model to generate DILI. During the last decade, there has been substantial progress in understanding the intracellular mechanisms of cell death, sterile inflammation, and recovery after APAP overdose. The most relevant models that have fueled this new knowledge are in vivo mouse models, primary mouse and human hepatocytes, and certain metabolically competent hepatoma cell lines (e.g. HepaRG) (Fig. 1). Additional models, such as humanized mice, are in development and could expand the experimental tool box. Importantly, translational studies with patients provide support for the clinical relevance of many experimental models. It can be expected that this increased insight into toxicity mechanisms in experimental models and in humans will lead to improved therapeutic interventions and better strategies to detect potential relevant hepatotoxic drugs in development. Furthermore, the success with APAP from understanding experimental systems to the human pathophysiology could serve as an example for making relevant progress in other areas of drug hepatotoxicity. Work in the authors' laboratory was supported in part by grants from the National Institutes of Health (R01 DK070195 and R01 AA12916), the National Center for Research Resources (5P20RR021940-07), and the National Institute of General Medical Sciences (8 P20 GM103549-07) of the National Institutes of Health. Additional support came from the “Training Program in Environmental Toxicology” T32 ES007079-26A2 (to M.R.M.) from the National Institute of Environmental Health Sciences. Writing the review and approval of the final version (HJ, YX, MRM). Copyright © 2014 The Second Affiliated Hospital of Chongqing Medical University. Published by XIA & HE Publishing Ltd. All rights reserved. This is an Open Access article distributed under the terms of the Creative Commons Attribution-Noncommercial 4.0 License (CC BY-NC 4.0), permitting all non-commercial use, distribution, and reproduction in any medium, provided the original work is properly cited.